It was a great weekend for sure,weather was fantastic!,the competition was great,and the new track layout is great. It was my first time at CMP in a car,I raced Karts there many times, and can tell you the track is much improved.I want to give a BIG thanks to King Rat Racing for all that you do for the SM class,You are a Class Act!I also want to thank Tom Neel at THE PARTS GROUP for all your support!Hyperfest looks to be a wild and crazy weekend, see you there. Congrats Dean on the double wins and the new lap record. You need to start at the back of the pack to make it more interesting! Now if we could just get rid of those darn Sentras. Dean walked the field again but it was Kevin Kopp who almost stole the pole on Sunday. Out of class traffic was tough out there. Devin was solid both days, stayed out of trouble, nippin at my heels on Sunday. I had fun doing a spin at one on Saturday, starting to be my trademark? I gotta fix them brakes! Sam, fun racing with you as usual. We even had a special guest appearance of Chip Herr on Sunday! Congrats Dean and Kevin!! I'm proud of you guys. Glad to hear about the nice track improvements. See you at the next one. Track record for NASA? 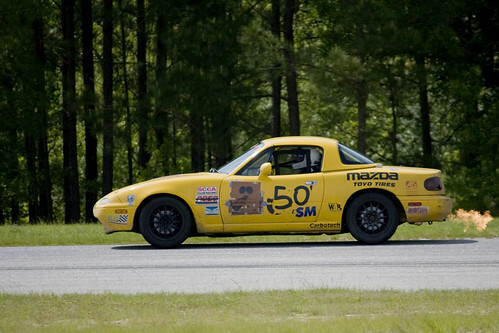 What is SCCA track record there? Great racing all you guys! I also have to echo Dean - King Rat, you guys rock. Thanks SO much for your support of SM in NASA-MA. We appreciate it!!! "We're all here 'cause we're not all there." I'm surprised Finishline Productions hasn't posted my In-Car view. Soon! Chris must have had to play engineer today. Now that was a definately a "Both Feet in spin!" Good job everyone for avoiding the car parked in the middle of the track, backwards! Was there money for the podium? 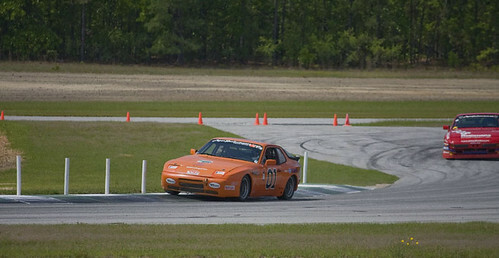 SCCA track record is 1:49.940 by Cliff Brown at the February national. Was the track better than it used to be? I was never a big fan of CMP, did those of you who ran the old track like the new config better? Hope to see everyone soon. #90 SM 2008/2009 Carolina Cup Pro Series SM champions. Need a salvage Miata part? We've got that! Way to go on your win at Daytona! Sounds like you and Mark had fun. The new configuration flows better but we basically lost 2 braking/overtaking turns and now have a multi-apex increasing radius turn. But there have been some nice improvements since I was there 2 years ago, new large garage/carport, paved infield roads, a snack bar, etc. Wow, must have missed that spin at T1 while I was talking to one of my students. Here's a few I shot, there's a few more to come, but it was a busy weekend for me and I didn't take that many of other SMs.